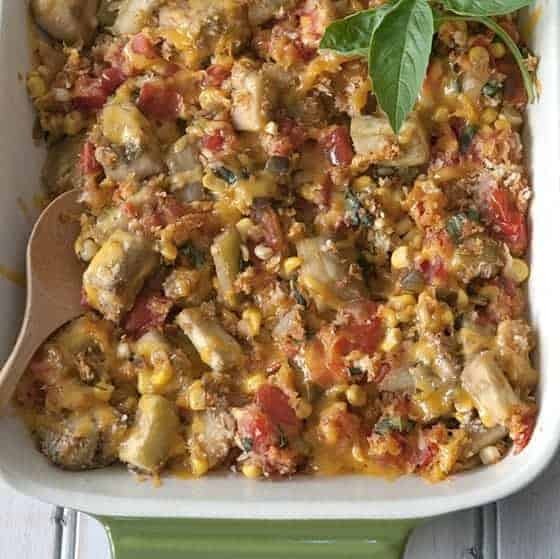 This mixture of garden-fresh veggies includes corn, eggplant, tomato, and basil. 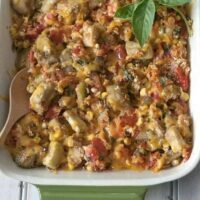 This delightful combination comes together in a side dish I like to call Corn and Eggplant Vegetable Medley. 100+ temperatures are stagnating around us like a lazy fog here in Texas. My motivation and inspiration in the kitchen have melted away faster than frozen-hard butter melts in a microwave. Because of the high temperatures, cooking seems like a lot of trouble. If I do cook, it’s mostly without a recipe. 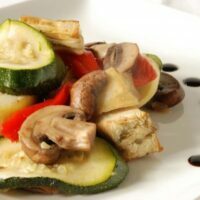 All this means I have been pulling out my familiar, but simple favorites like this Corn and Eggplant Vegetable Medley. It’s perfect for people who want to eat more veggies but are tired of green beans and carrots. Last week, we had to move my mother into a skilled nursing center– temporarily. Thankfully, it’s in the same place where she lived independently with my dad since 1991. Tomorrow, we are moving her to an assisted living apartment. She won’t be able to take many belongings with her, so we have much work ahead of us to clean out her two-bedroom apartment. Have you been through this yourself? If so, you can certainly understand decision-overload and guilt! Thank God for my sister who has traveled here to help me with the million and one decisions ahead of us. 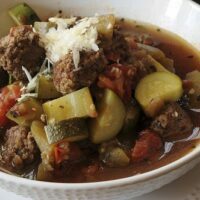 Mini meatballs combined with eggplant, zucchini, tomatoes and Italian spices in a delicious soup--easy on the waistline. 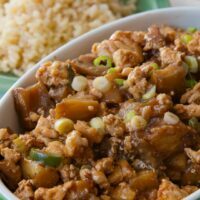 Ground chicken stir-fried with eggplant and served in a spicy sauce--a re-creation of a restaurant fave we used to order at P.F. Changs. 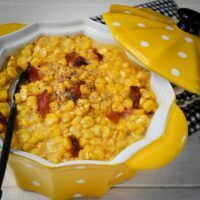 Everyday creamed corn gets dressed up for dinner with a slightly caramelized sauce and maple bacon. Combine eggplant with other garden-fresh veggies for a delightful summer side dish or vegetarian entree. 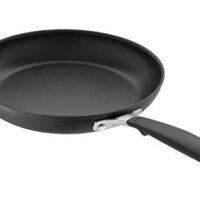 Heat oil in large skillet. Saute onions and bell peppers until soft. Add corn and saute a couple of minutes until corn is slightly browned. Add eggplant. Saute and stir until eggplant starts to brown. Cover and allow to cook another 5-7 minutes or until eggplant begins to soften. Add tomatoes and cook another minute. Add bread crumbs and bacon (if using) and season with salt and pepper. 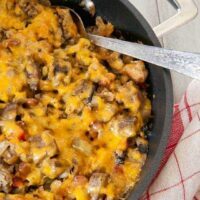 Stir in half the cheese and pour into a flat casserole dish. Sprinkle with remaining cheese. Bake at 350 degrees for 20-25 minutes. If it's too hot to turn on the oven, put a lid on the skillet after you have added all ingredients and turn the heat down low 'til it's heated through and the cheese is melted. If you're grilling, put the covered skillet over indirect heat for similar results. I have just discovered your blog, and, after reading this post, I’m definitely a fan! My mom will be 88 this fall, so I can relate to much of what you’ve said. I am fortunate that I have a great partner who is willing to let me stay home, so I can be with my mom. Two years ago, I was laid-off, and, truth to tell, it was exactly what I needed. My mom, my partner and I have lived together for several years, but, when I was working, I worked long hours and would come home to find that mom hadn’t eaten all day (she’s diabetic, among other things.) She just lost track of time, she said. She doesn’t have dementia, or Alzheimer’s, thankfully … it’s just the normal slowing down in the brain. It’s so tough to watch. My parents were in their 40s when I came along, and, my father died when I was 14, so it’s been mom and I for most of my life. Having older parents means I have been surrounded by older relations and older family friends, so I’ve watched so many of them age and die. I read your sentence, “…o I find myself hoping I myself will get run over by a truck and skip the whole growing old routine”, and I nod my head in agreement. Here’s to our elder parents! I’m glad I’ve discovered your beautiful blog ! I just wanted to thank you for this recipe – I made it last week and it was divine! I threw in a yellow squash since our garden is currently overflowing. Simple and delicious! Hi, Just wanted to say thanks for the great ideal “salad in a jar” I made mine last week and enjoyed having fresh lettuce at my finger tips. I have a question about your glazed fresh strawberry pie. Can you use sugar free jello in place of the regular strawberry jello?Thanks again for a great blog with yummy recipes. I love the picture Paula! But I have to admit I can’t focus on the eggplant recipe with Grandmother’s yummy carrot cake looking back at me!!!!! I am sure you and Bonnie have done a great job with her apartment. You are a great daughter!!! looks yummy! like you, i’ll have to make it when i’m more in the mood to cook. didn’t you say something last week about this heat being about as bad as being snowed in? good way to think about it! the only way to be outside is to be in the water somewhere! your pool is a great hangout spot! continued prayers for y’all and grandmother during this time of transition/change. love you! I totally relate to the changes you are going through. I lost my Mom last September, and she was 98. She had lived with us for 8 years, and the last year was difficult, because she had some dementia. I actually feel better after reading J. Beatty’s comment above, about feeling the “should have done more”, because I feel it every day. I know what you mean about getting run over by a truck 🙂 – I feel for you and send you my prayers! I’ve never cooked with eggplant, but I am feeling the tug after seeing your photo and recipe. Thanks for the recipe…I love eggplant and corn so I’ll put it on the menu docket. Re your Mom, both you and she will adapt…but be prepared for sad times…it will get better as she gets used to her new surroundings…let her make enough choices re her belongings as possible…let her take what she loves. I took care of my Mamma until her 89th birthday (unfortunately with not much help from her other children) and am so grateful I had the time to spend and care for her. However, even after almost 10 years of her departure, I, too, feel I “should have done more”…I think guilt, etc. just comes with the territory when you love someone as much as most love their Moms – we want only the best for them. May God bless your Mom and your family…it might be a bumpy road in the beginning but the road will soon smooth out. Change is hard!. Hopefully your mother will get settled into her new place and you and your sister will have peace knowing that she is getting the best of care. Your veggies look great and I have most of the ingredients growing in the garden. This vegetable medley look delicious. I just brought home 2 eggplant from the market because they look so good. My mom is living in a very nice apartment right now but I don’t think she should be on her own. My sister and brother aren’t as concerned as I am. I know decisions will need to be made in the near future. Hope the transition goes well for your mom. Paula, your mom looks great for 93! I do understand and empathize with your feelings about the aging process. Longevity is in my genes, too. Two of my grandparents lived to be 90, and I have an aunt who is 93. My own mother is 84 and lives in a senior apartment, independently for now. We are getting ready to sell the family home. It is all just so mentally and emotionally taxing. At least your mother lives close, so that does help. Good luck with the many decisions you are making on your mother’s behalf. Paula, I know it doesn’t make it any easier, but I understand exactly what you’re going through with your mom. Sending good thoughts for you while you go through this transition. This sounds like some awesome comfort food! Best of luck with your mom’s transition. I don’t look forward to going through that with my parents. Toasting to this dish and the awesome longevity in your family! Love the picture! And now, after reading this, I feel ashamed to be whining about the heat here in Colorado! It’s nothin’ compared to Texas! Dana, my sister is here from Denver and she’s dying on the vine. Keeps telling me what the temps are back home–y’know, 90’s kind of stuff. Hopefully, your two little fish have a place to swim and keep cool.